Ambience: The 72 cover restaurant has two sections. One which has an artificial garden ‘feel’ with wick chairs and bamboos and an indoor section that has subtle accessories and large paintings on the wall. A glass wall frames the open kitchen for you to see how your food is being cooked. 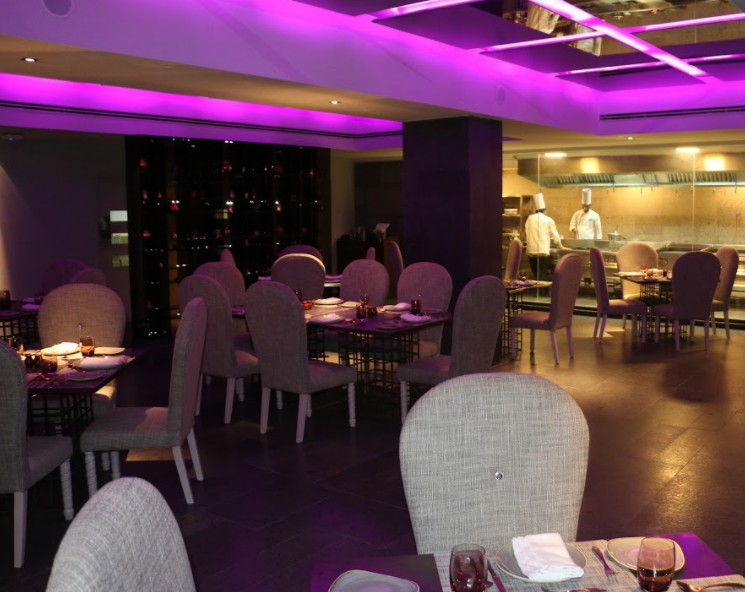 The restaurant is done up in shades of grey and the interior section has panelled lighting in pink on the ceiling. The ambience is chic and contemporary and the tables are at a comfortable distance from each other. The restaurant is only open for dinner between 7:00 p.m. and 11:30 p.m.
What we ate and drank: Tijouri focuses on North West Frontier cuisine and the menu has been given an overhaul to include a nice balance of choices. Executive Chef Kasiviswanathan Muthuraman has carefully selected spices from different regions of India and also has used a few international ingredients to pair with Indian dishes and decided to sample a selection of vegetarian dishes suggested by him. We started with some wholesome soups including the Tomato Dhaniya Shorba a thin broth of tomato scented with coriander and ginger and the Dal Ka Shorba made with roasted lentils broth flavored with coriander and ginger. The latter is a must have for its wholesome flavour and hit of garlic that works beautifully. 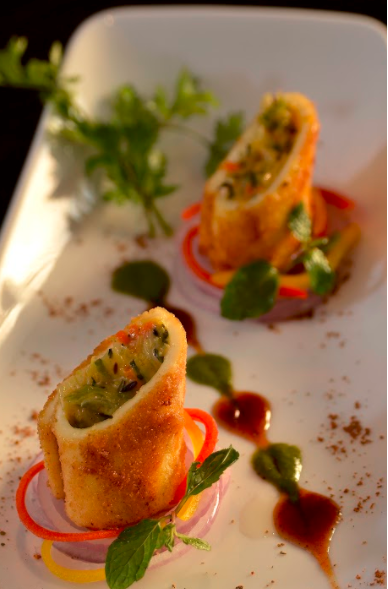 For starters try the Paneer Shahi Roll, a shallow-fried thin layered Indian cottage cheese filled with vegetables and cheese that is delectable and melts in your mouth. The Hare Matar Ki Tikki is filling and is made with mashed green peas stuffed with dry nuts and cheese and cooked on a hot plate. The Malai Broccoli Tikka is another winner made with florets of broccoli marinated with creamy cheese, chilli, vinegar, coriander and ginger garlic paste, spiced with cardamom and cooked in an Indian clay oven. The crunchiness of the broccoli comes from the fact that it is not cooked but cleaned well in hot water and cooked in the tandoor so it has a nice smoky flavour too. For the main course, go for the assorted bread basket and accompany these with the Paneer Khurchan made with fresh cottage cheese batons, pan fried with tomatoes, capsicum and tempered with mustard seeds and Dal Makhani a harmonious combination of black lentils, tomatoes, ginger and garlic simmered overnight on slow charcoal fire and finished with cream, served with a dollop of unsalted butter. 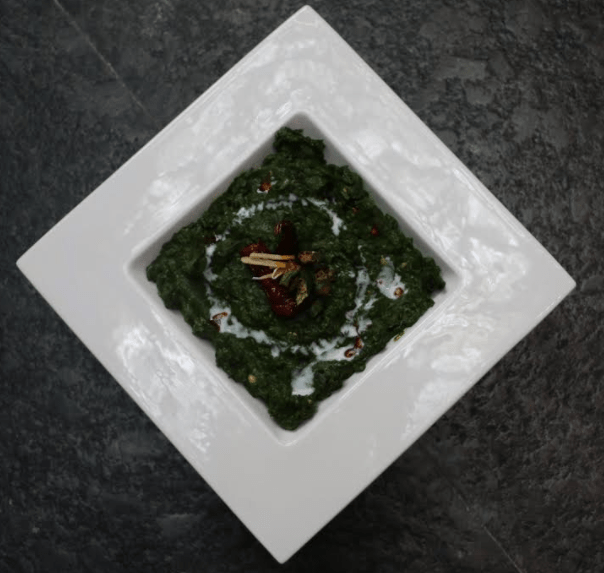 I however highly recommend the Bhindi Palak Ki Bhurji a Chef special creation of okra and spinach – both unusual dishes that work in tandem to create a creamy dish that you cannot stop eating. The other speciality is Tadke Wala Dahi a hung yoghurt preparation served at room temperature that has south Indian tempering and garlic, sugar and is like an Indian cheese spread and teams well with the breads. The Subz Ki Dum Biriyani made with assorted vegetables marinated and cooked along with the finest basmati rice and handpicked Indian spices in a dum is so flavourful that it needs no accompaniment. Round up with the Masala Chai Crème Brûlée another chef speciality that is yummy as well as the Imarti and Saffron Chiroti served with hot or cold almond milk! “I am extremely particular of the quality of ingredients that enter the kitchen. In fact my receiving manager spends over two hours checking the ingredients and passes only those that are of the standard quality. This impacts the quality of the food and we are quite clear that this is something we do not compromise on,” says Chef Muthuraman. And you could not agree more when you have a meal here. What we’d eat again: Definitely the Tadke Wala Dahi for its unusual flavours that are light and creamy. Price Points: Rs. 2800 plus taxes on an average for a meal for two. Rinse and dry the bhindi and cut them into ring shape and dry fry and keep aside. Blanch the palak and puree it. Heat oil in a pan; add jeera seeds, chopped garlic, onion, chilli sauté till translucent or light brown. Then add the chopped tomatoes and cook it well. Add turmeric powder and jeera powder, kasoori methi and salt and cook well. Add the palak puree cook it well and add the bhindi stirring gently till the whole masala mixture coats both the palak and bhindi completely. Stir and sauté for 1-2 minutes. Add the cream and butter then ghee. Lastly add some crushed kasoori methi and sauté palak and bhindi for a minute more. Garnish with fried dry red chilli and cream and some sliced ginger. This story appeared in the Femina issue dated Oct 1, 2017.